James J. Strang was the only person following the death of Joseph Smith to claim that Joseph appointed him to be his successor in the prophetic office. At the exact time of Joseph Smith’s death, a host angels appeared to James J. Strang and an angel ordained him to be a prophet, seer, revelator, and translator. Angelic ordination was mandated by Doctrine and Covenants 43:7 which referred to Joseph Smith’s angelic ordination in the Doctrine and Covenants 27:12-13 and 128:20-21 In September 1844, an angel revealed to James J. Strang the location of records buried in a local hill near Burlington. Four of his coverts followed his directions and dug up the brass plates covered with an alphabetical and pictorial record from undisturbed soil beneath a sizable oak tree. The case that the plates were contained in disintegrated the minute it hit the open air. These men publicly testified that there was no possibility of fraud. Strang then translated the “Voree Plates” by using the Urim and Thummin. At Beaver Island, James J. Strang also used the Urim and Thummin to translate the ancient Jewish record taken from the plates of Laban which contained The Book of the Law of the Lord given to Moses on Mount Sinai. James J. Strang printed this record containing the Ten Commandments in 1851, and in 1856 reprinted this information along with a variety of chapters of different subjects. The Book of the Law of the Lord is the only book that contains all of the original Ten Commandments that were given to Moses in that it restored the Fourth Commandment, “Thou Shalt Love they Neighbor as Thyself.” Also restored was the seventh day as the Sabbath and the explanation it was changed to Sunday by pagans in horror of the sun god [the day of the sun], they were superstitious and ungodly people. 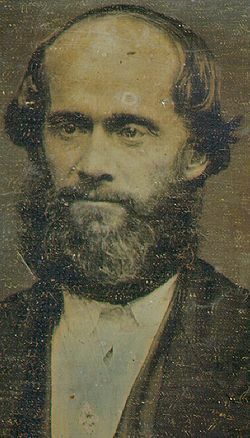 James J. Strang was mortally wounded by apostate members in 1856 at Beaver Island and died several weeks later at Voree. Although coherent at times, James J. Strang refused to name a successor. This was in accordance with his teachings that the “lesser cannot ordain the greater” As only a heavenly being had the authority to ordain a man to be prophet, seer, revelator, and translator, as in the cases of Joseph Smith and Moses, he realized such an ordination was impossible. Strangites believe according to 1 Nephi 13:42 the dispensation of the fullness of times would be in two portions: The opening portion to the Gentiles and the second portion to the Jews. The opening portion, according to Lehi in the Book of Mormon, it was to be composed of the ministries of two prophets.The first prophet was to be of the tribe of Ephraim, he is to be immediately followed by a prophet [James J. Strang] of the tribe of Judah. Joseph Smith, of the seed of Joseph in Egypt and the tribe of Ephraim was to “bring forth my word (Book of Mormon) unto the seed of thy loins, and not to be bringing forth of my word only, saith the Lord, but to the convincing them of my word, which shall have already gone forth among them [the Bible. ]Lehi prophesied: “Wherefore the fruit of thy loins shall write, and the fruit of the loins of Judah shall write; and that which shall be written by the fruit of thy loins, and also that which shall be written (Book of the Law) by the fruit of the loins of Judah, shall grow together, unto the confounding of false doctrines and laying down of contentions, and establishing peace among the fruit of thy loins, and bringing them to the knowledge of their fathers in the latter days, and also to the knowledge of my covenants, saith the Lord.” [2 Nephi 3:11-12.] See Ezekiel 37:15-20.Joseph Smith, the stick of Ephraim, brought forth The Book of Mormon and he was immediately followed by James J. Strang, who was of the tribe of Judah, brought forth the Book of the Law of the Lord. Strangites also believe that in accordance with 1 Nephi 13:37; 1 Nephi 14:1-2, 5-; and 2 Nephi 6:12 the Gentiles did not humbly accept the restored gospel and becoming a righteous people. During Nephi’s replication of his father’s vision, the angel explained that there are two alternatives for the Gentiles. They can repent and be rewarded or harden their hearts and be punished: “For the time cometh, saith the Lamb of God, that I will work a great and marvelous work among the children of men; a work which shall be everlasting, either on the one hand or on the other – either to the convincing of them unto peace and life eternal, or unto the deliverance of them to the hardness of their hearts and the blindness of their minds unto their being brought down into captivity, an also unto destruction, both temporally and spiritually, according to the captivity of the devil, of which I have spoken.” (1 Nephi 14:7) make reconciliation for the sins of the people. 18. For in that he himself hath suffered being tempted, he is able to succor them that are tempted.”Book of the Law page 156:38. “Made of the seed of Abraham, of the tribe of Judah, and the house and lineage of David according to the flesh, tempted and tried in all things as we are, and partaking with us of the common infirmities of human nature, he was holy, harmless, and without sin.”Almighty God and Jesus Christ are two distinct and separate persons. Jesus is the Mediator between man and God. He was and will remain subordinate to God. John 10:29, “My Father, which gave them me, is greater than all;” John 14:28, “Ye have heard how I said unto you, I go away, and come again unto you. If ye loved me, ye would rejoice, because I said, I go unto the Father; for my Father is greater than I.”1 Corinthians 15:28, “And when all things shall be subdued unto him, then shall the Son also himself be subject unto him that put all things under him, that God may be all in all.” John 17:3-4 “And this is life eternal, that they might know thee the only true God, and Jesus Christ whom thou hast sent. 4. I have glorified thee on the earth; I have finished the work which thou gavest me to do.” Our Lord and Savior, Jesus Christ, is the Son of God by holding the priesthood of an endless life. These are some of the major points of belief in this Church. If you are interested in learning more concerning our doctrines and beliefs please contact us through this website.